So it’s Christmas morning and my human presents us with just two packages! Binga and I were wondering where Boodie’s was. My human said that instead of getting us a bunch of smaller gifts, we were getting bigger ones and had to “share,” whatever that means. I couldn’t believe my eyes when I saw my first gift! 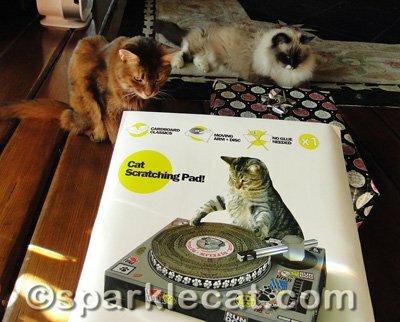 It was one of those DJ cat scratchers that I wrote about a few weeks ago. I was bummed because they sold out, but apparently my human got one in time! Then I saw… the dreaded instructions! 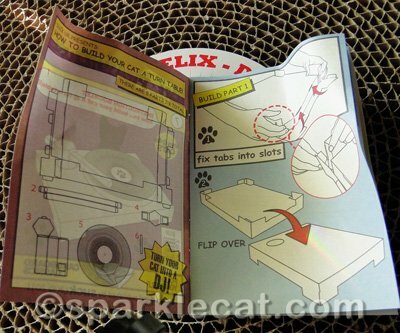 My human asked if we wanted to see the second gift while she was putting the DJ cat scratcher together. Of course we did! I knew it was going to be a while. How cool! 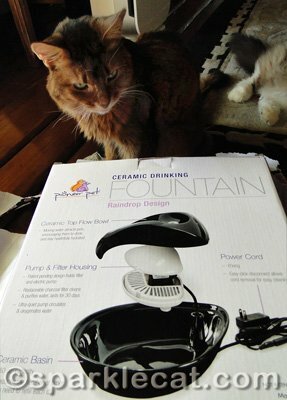 My other present was one of those fancy ceramic fountains! I’ve been wanting one of those for the longest time, and our old Drinkwell has been broken for months. We’ve still been using it, but it does not run anymore. A new fountain has been long overdue. But… wait a minute! What do I see here? I can’t believe it. First my human buys one that has already been opened and returned — and then she forgets to take off the label. How cheap, and thoughtless! At least it did not take her too long to assemble the DJ cat scratcher. 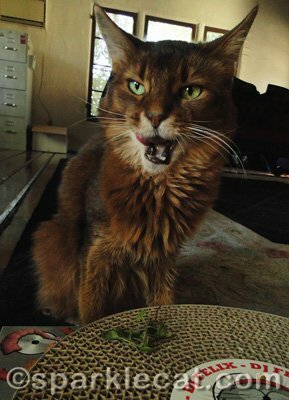 And she brought in a sprig of Christmas catnip from the garden! 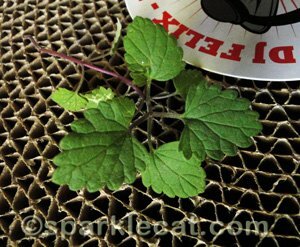 How great to finally have my own fresh nip! 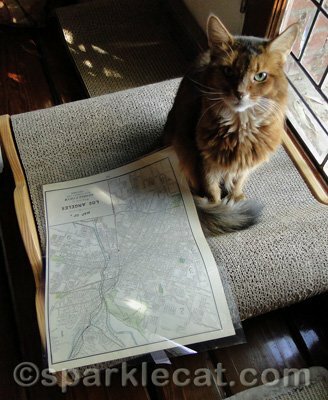 Oh, and if you were wondering what my human gave her boyfriend that was 112 years old — it was a vintage map of downtown Los Angeles from an 1899 atlas! Before there was Dodger Stadium or even freeways. My cats dont like to share either. Also, they used to have a cat fountain and refused to drink out of it. Instead they like to drink out of the waterfall fountain in the dining room. I hope you had a happy holiday! Wow, kitties you got amazing pressies for sure! Congrats! Can’t wait to see the pics of you all using the DJ Scratcher! 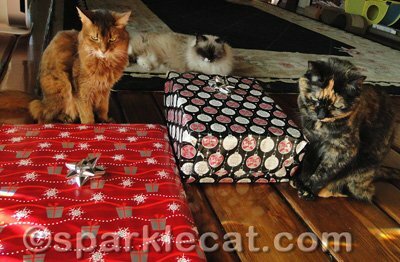 Sharing is a tough concept, especially for cats, but those are still very awesome gifts! You are lucky kitties. The map sounds really great! I love old maps. Looking forward to hearing more about the Secret Paws package. Score! Even without the scratcher and the fountain–just look at those plump enticing leaves! Mmmmmmmmmmmmmmmmm. Yeah, people and old stuff. Whatever. Ok I am BEYOND blown away by the AMAZING Christmas presents that you received!!! Wow! 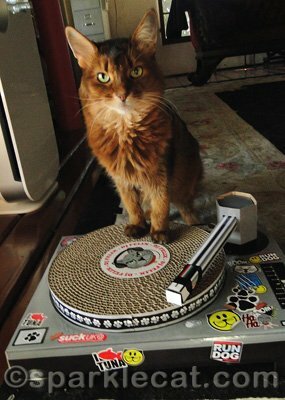 That DJ Cat Scratcher is just too darned cute…you are one hip kitty!!! The fountain is amazing and I rolled with laughter about the 20% off lol……. So happy you had a wonderful Christmas, you sure deserved it! We hope your Christmas was wonderful. A big and warm hug. 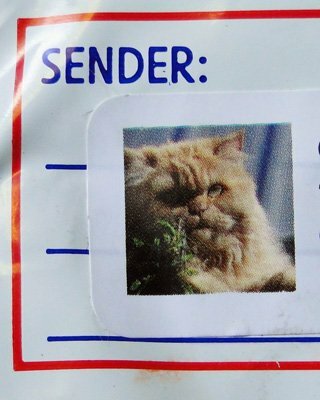 OMC…you got a package with GJs photo on the return address label!!!!! Woo hoo! I sure hope he left some of his gorgeous furrs in the box for you to sniff. Totally cool presents! Looks like your Secret Paw partner is GJ!!! About the new cat bed at our house (per your comment): the tag said Dog Bed small Pour le Chien on the front side and Cat Bed Pour le Chat on the reverse!! And it was 50% off, otherwise they would have been too cheap to buy it. But that was not on the tag, thank Cod! Some of those postal humans are soo inconsiderate! What pawsome gifts you got! Now if only I can get the Woman to post the lovely gifts I got! That’s a cool scratcher! You’ll really be ready to join your human’s band soon! The fountain looks pretty neat too. We want one of those but who knows when we’ll actually get one. Yay for Christmas nip! How fun to get a present from the handsome Jasper too! I LOVE that scratcher!!! I think your human did a nice job. My kitties had to share bigger gifts too. Wow, you got some great presents. I can’t wait to see you scratchin’ on that turntable! Oh, it is so nice that you got a present from Ginger Jasper even though he is not feeling well. And be nice to your human. She works hard for you and deserves some respect. 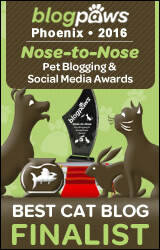 Pawsome stuff! 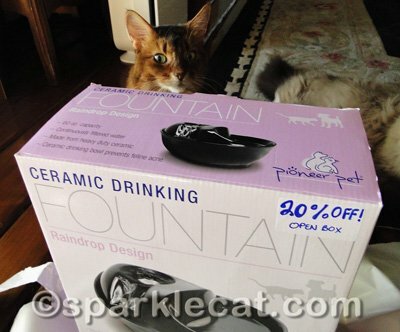 We especially like that fountain – ok, we know the hoomin was cheap, but what can you expect? We get the same treatment. Sighs. The ceramic fountain looks great! You’ll have to let us know how you like it, Sparkle. And explain “sharing”. We’re unclear on the meaning…scratch on! Awesome gifts! 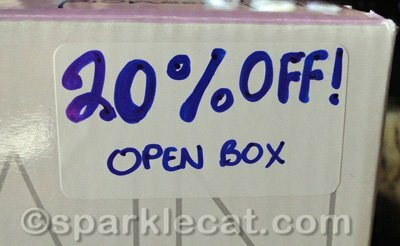 (except for that whole “open box” thing). We got stuff from Purrfectplay that we are totally into. 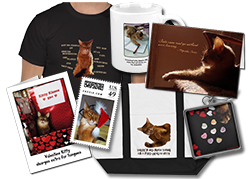 What PAWSOME Christmas presents yous guys gots and that your human saved 20% even better. Now me can’t wait to see what GJ sended yous! Great presents!! Can’t wait to see what you received from Secret Paws!! Hope the scent of the new nip was worth the wait. Totally awesome gifts! Looks like y’all had a very awesome Christmas! I think you guys did great. Forgive the human for leaving the 20% tag on – she probably does not realize you can READ! How cool that your Secret Paws came from GJ! He’s one of our favorite friends. Okay, next party, DJ Sparkle will be working the floor. Please let us know how the water fountain works out. My Mommie has brought a couple that did not work out for us, so she is on the look out for a good review. What cool presents! I keep axing for the 360 fountain but still haven’t gotten it. Have fun playing DJ! Merry Christmouse! Those gifts look great. We have that ceramic fountain and we love it. Mum has to turn it off at night though because I like to scrape the water out. We are looking forward to seeing the goodies you got from GJ. It looks like you had a wonderful Christmas!!! Maybe your mommy will buy extra treats with all the money she saved?!? We’re anxiously awaiting to see what your Secret Santa gave you! Do you know that kitty??? Wow, those are awesome gifts!! My kitties are so jealous you got the DJ cat scratcher!! Glad you had a great Christmas, Sparkle! That cat scratcher is so cool! Hey, we have a ceramic fountain just like that, it is wonderful…but follow the cleaning instructions closely so it will always be good. How cool, your Secret Santa is GJ, so special!!! Well, Sparkle, we think your Christmas was pretty good. We love that DJ Scratcher! Ernie wants one now since he thinks he’s a rapper…his rap name is “Easy E.” And we have that same fountain! Now we can’t wait to see what GJ sent all the way across the pond!! A Secret Paws from GJ! Now that is truly a wonderful gift! Congrats on the big-ticket (if reduced…) loot! Zowie-that looks like the mother of all cat scratchers! I’d say you all really raked it in. OMC that scratcher is pawsome and the fountain looks really nice. AND you got fresh nip AND a package from a special friend!!! We can’t wait to see what’s in your Secret Paw package from GJ! Those sure look like two great presents. What fun that scratcher will be. And how exciting to have a new water fountain. And then the package from GJ. That will be fun to open. Can’t wait to see what he sent to you. We are just glad he could send something. Have yourselves a great week. That cat scratcher looks great – we asked Mum if she’d seen them but she said she hadn’t so it looks as though the scratchy post will be getting some more workouts!! Oh the joys and tribulations of presents! We always have to share – though some of us do it better than others. And to be honest, because the others don’t look after stuff like I do, things get a little bit damaged so if the humans save money on pressies it’s okay by us – we get more money for treats! But your presents look great and we want to hear how long you are scratching the decks for Missy Sparkle, DJ Boodie and MC Binga! And the Secret Paws is of course going to be excellent.